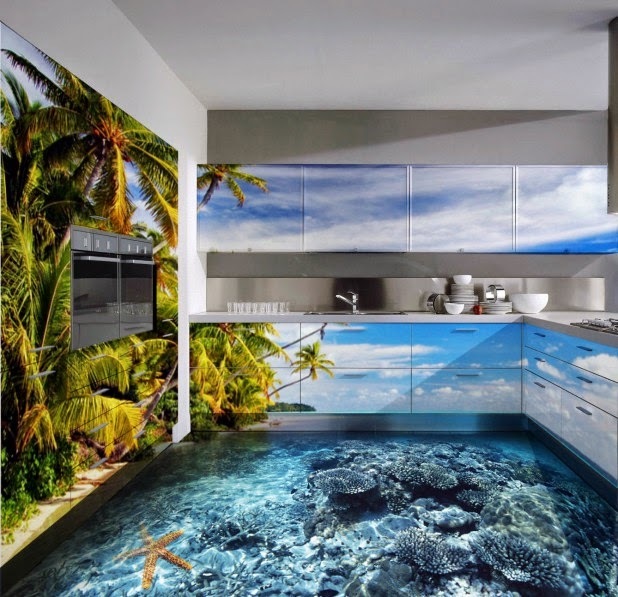 The 3D technology is gaining increasing popularity: 3D wallpaper , 3D wall panels, and 3D floor art. The floor is the basis of 3D volumetric image that brings novelty to your mind as it look like floors. 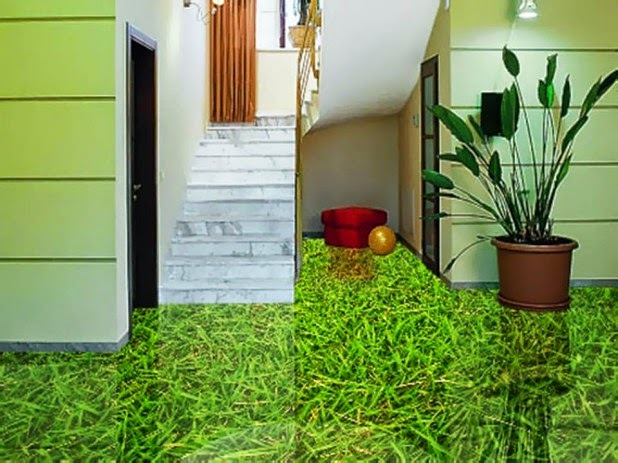 It is not just 3D flooring, it is a beautiful and unique 3D floor art object, which is fun for many years, because it is very strong and durable. Thinking about how to make your house or apartment exclusive and unique, take a look a new kind of flooring, self-leveling floor compound with a 3D flooring effect. Just do not think that you need any special equipment or glasses. 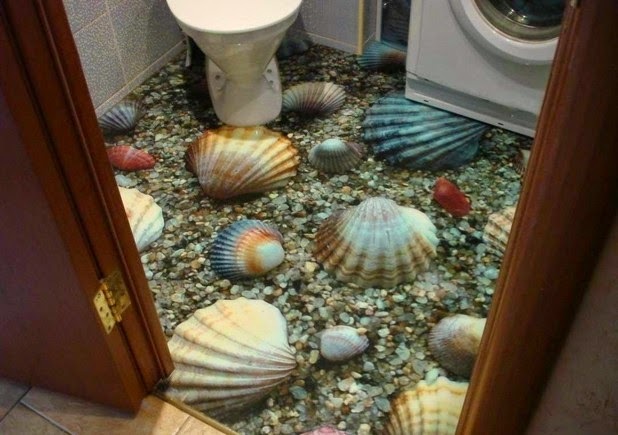 live floor with a special technology allow to create a small miracle in your living room or bathroom. All this, and still there are many other interesting and unusual options offered by the self-leveling floor with 3D floor art. 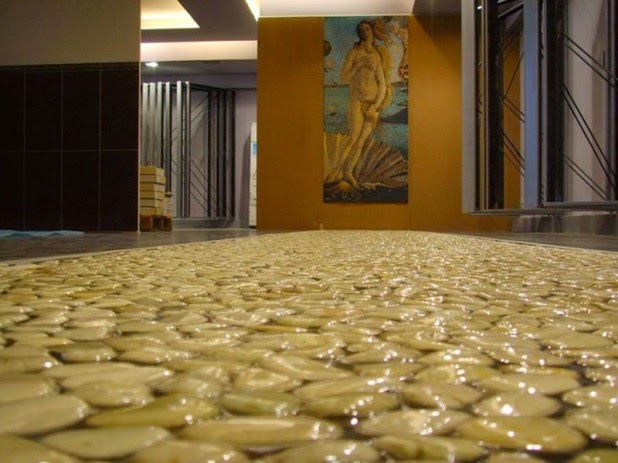 Currently, polymer 3D floors art has been used in shopping malls, halls, offices, homes and apartments due to its creativity and high performance. Environmentally friendly - self-leveling floor compound has no odor and corrosive fumes. According to the structure resembles a stone. High strength - when the 3D flooring is properly installed, it retains its properties for a long time. 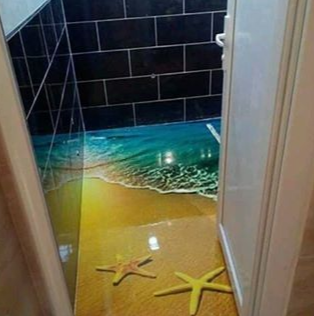 Easy maintenance - self leveling 3D bathroom floor has no cracks, pores and gaps make the 3D flooring is absolutely immune to any kind of dirt, dust, water and chemicals. Any cleaning will not take much time. 3D floor designs can visually solve many problems of the room interior because of the unique aesthetic qualities. 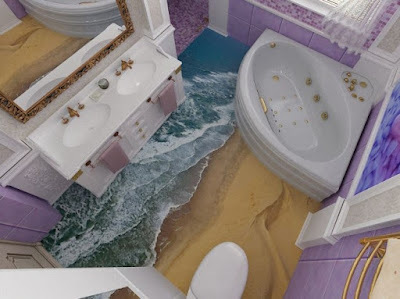 In a small rooms, with choosing the right 3D floor design, color and pattern, with the help of self-leveling floor you can visually increase the bathroom space. 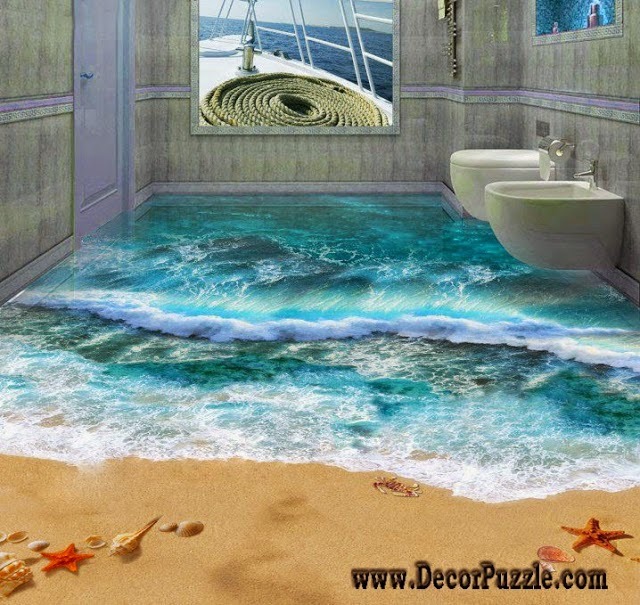 In large rooms 3D bathroom floor art is a highlight, which attracts the gaze endlessly. In developing the design of the project facilities, 3D flooring graphics can become a good helper for the implementation of the imagination of the designer. 3D floor art can be not only a great three-dimensional 3D floor graphics, but also to imitate wood, stones, sequins, petals, coins and other items. Installation of 3D flooring murals is very difficult and responsible process and does not tolerate even the slightest error, so the best option would be to call a master. But if you, nevertheless, decided to install the chosen 3D floor design by yourself, you need to pay attention to some features. First you need to make a foundation for the 3D flooring. Most often, it is a screed concrete. the installation of the 3D floor art foundation should be so that there were no cracks, no bevels and the entire surface must be perfectly smooth. The next step you need to completely clean the surface. On the floor, there shouldn't be even the tiniest of dust. One of the most important stages in the installation of the 3D flooring, is to make sure that the floor humidity is minimal, otherwise, you just throw out of money because the top 3D floor murals will be covered with cracks. 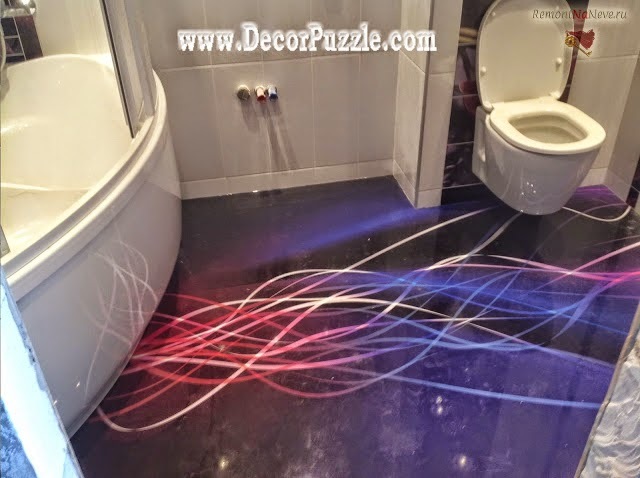 If the basis of the pattern you have chosen is 3D floor mural, you need to check that, after bonding to the substrate was nowhere folds or creases. 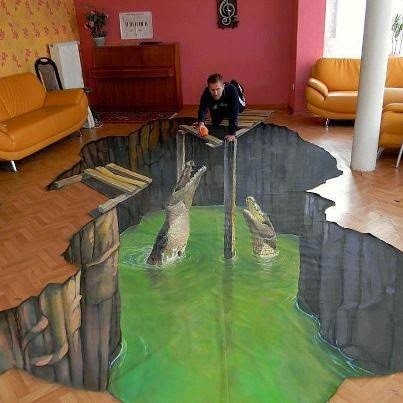 If you decide to perform a drawing with painting 3D floor art, then after drying, it is necessary to cover the primer design. Mixing the polymer with a curing agent you need a mixer, and in any case by hand. Ready mix to fill the 3D flooring takes one hour. If the area of the room is very big, then you need to divide it into parts, each takes an hour for filling. You also need to take care of shoes, so as not to leave traces and fingerprints on the surface. The thickness of the polymer 3D flooring layer should not be more than 4-5 mm. It is not difficult, with the proviso that the surface is initially a perfectly flat. The structure of the 3D flooring polymer is aligned itself, but to create a perfectly smooth surface using special tools (roller or squeegee blade). They do not leave air bubbles. It is necessary to clearly follow the time frames for each stage of the work. The final stage - fill the 3D floor design with a protective varnish. self leveling floor consists of a printed image, which is anchored to a concrete base and top coated with polymer liquid material. Such a self-leveling floor compound, that is, after the application of the polymer material, self-aligned to create, in the end, it is a solid, smooth and seamless surface with 3D floor art. Like any other flooring, self-leveling floors with 3D graphics, there are both advantages and disadvantages. We consider these in more detail. The most significant advantages of 3D self leveling floor compound is that they do not have any swings which making maintenance and repair are not a big problem. In addition, these 3D floors do not accumulate dust and do not create a favorable environment for a variety of pathogens. All plastic materials used for 3D self-leveling floor are safe for human health and hygiene, which is mandatory, is confirmed by certificates. 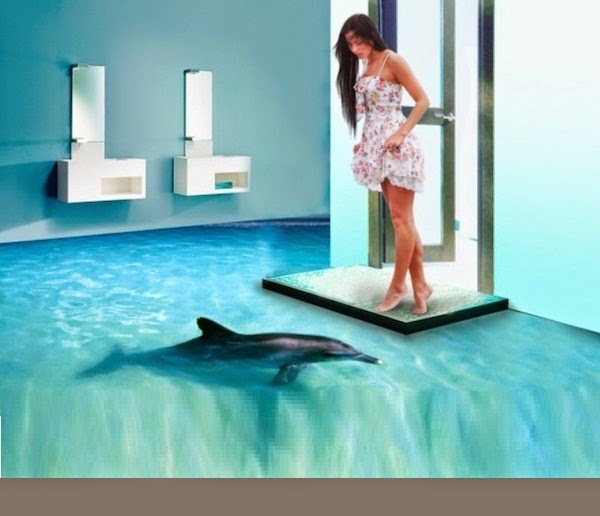 It is important also that such 3D floor murals is very resistant to high temperatures. In the case where a long time to cover the impact high temperature, such as in the event of fire, the self leveling flooring does not emit any toxic substances in the air. 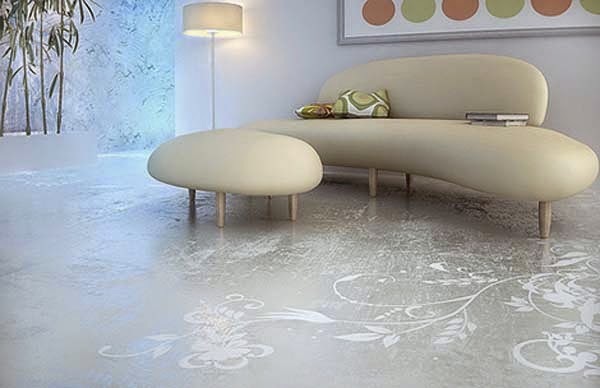 It is also important that such self-leveling floors have a very high wear resistance, as well as the fact that for a long time they retain their original look and given color. First of all, the fact that the complete 3D floor surface drying takes nearly a week. This is very inconvenient if during the repair of 3D floor designs you live in an apartment. It's quite complex to care for this 3D flooring. It's recommend to use a special washing and polishing machine that can, with the use of special chemicals, for a long time to preserve the beauty and luster of the self-leveling floor compound. 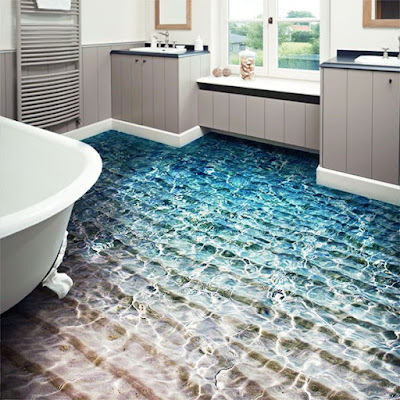 In addition, the disadvantage is the very high price of 3D floors.